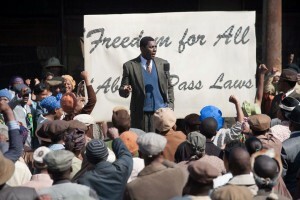 As the world continues to mourn the passing of Nelson Mandela, Idris Elba stars in the Justin Chadwick directed biopic adapted from Mandela’s autobiography, Long Walk To Freedom. What’s it about? Taken from the words written by Mandela himself, the film starts right from Mandela’s childhood in rural Xhosa and reveals how a young lawyer living and working in the time of apartheid in South Africa embarked on a historic fight for the rights of black South Africans. After spending 27 years in prison, Mandela is released with the difficult task of convincing angry black South Africans (including his own wife) why it was important for them to forgive and move on. Verdict: In the days immediately following his death, Mandela’s inspirational story was everywhere we turned; in the news, in documentaries and in interviews with people who never had the opportunity to meet him. So could another film based on Madiba’s life really add to the world’s appreciation of this legendary story? Director Justin Chadwick and writer William Nicholson must surely have struggled to decide how any moment in Mandela’s life could be left on the cutting floor. While it’s no surprise to watch the moments when Mandela and the ANC chose to fight with violence before their arrest, viewers may be more shocked to see Mandela as an unfaithful husband to his first wife Evelyn, in particular one scene which hints at moments of violence in the marriage. 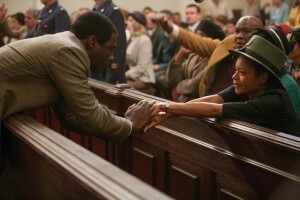 But the introduction of Mandela’s second wife, Winnie, reveals how her love and support was crucial to his willingness to die for his cause, and the film truly comes to life as soon as Naomie Harris hits the screen. In her most captivating performance yet, she demonstrates Winnie’s passion, fire and pain that reminds us just how much her fight kept Mandela’s message alive even when he couldn’t. We get to see just how much Winnie suffered and sacrificed for the rights of her people after her husband was sentenced to life in prison. Spending 16 months in solitary confinement and being beaten and humiliated while her daughters were forced to live without her makes her later behaviour more understandable. It also explains and makes it more heartbreaking that her inability to forgive led to the end of the pair’s marriage following Mandela’s release from prison. Idris Elba can do no wrong and is simply stunning as Nelson Mandela. From the vocals and physicality to Mandela’s mannerisms throughout the years, he nails it with ease. 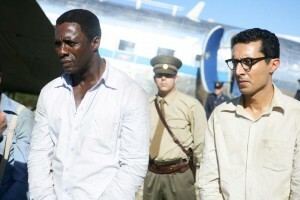 Elba reportedly even received praise from Mandela who thought he was watching himself when shown parts of the film. 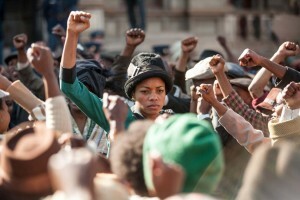 Elba exudes the strength and determination that made Mandela the inspiration he has become. Chadwick deliberately uses majestic sweeping shots of the South African landscape to show just how hate and injustice were ruining a land so full of beauty, although these shots were somewhat distracting from the gritty reality of apartheid. Despite being over two hours long, some aspects of the story felt a bit rushed. It will always be better to read Mandela’s autobiography to get the full details of his struggle but the film is a great tribute to his legendary fight for freedom. 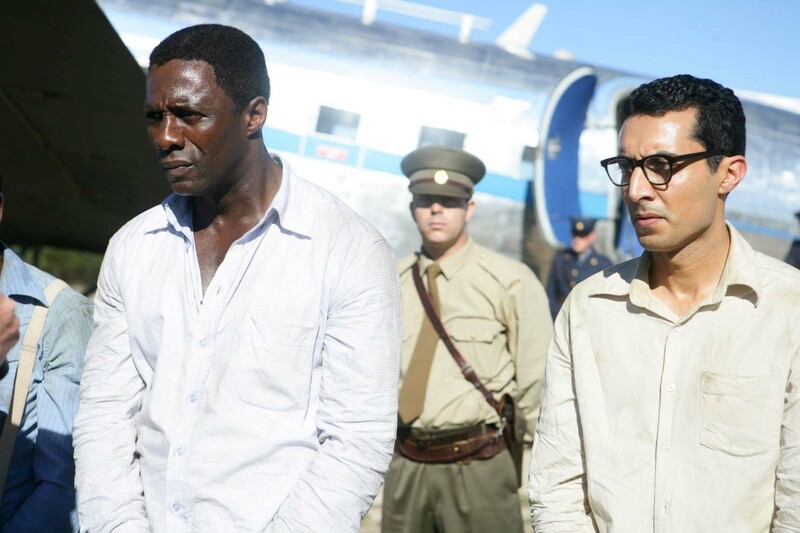 Final words: Mandela: Long Walk To Freedom perfectly encapsulates Mandela’s message of love and forgiveness but even with a running time of 146 minutes, you’re left wishing the film was a bit less rushed. Great performances though make this a good movie about an amazing man. Mandela: Long Walk To Freedom is in cinemas from 3 January 2014.